Kingston entrance door design in London Grey with arched sidelights and toplight, featuring sandblasted glass with a 10mm clear border. Polished Chrome Ring door knocker, Profile door knob, escutcheon (townhouse locking system) and medium sized letter plate from Samuel Heath. 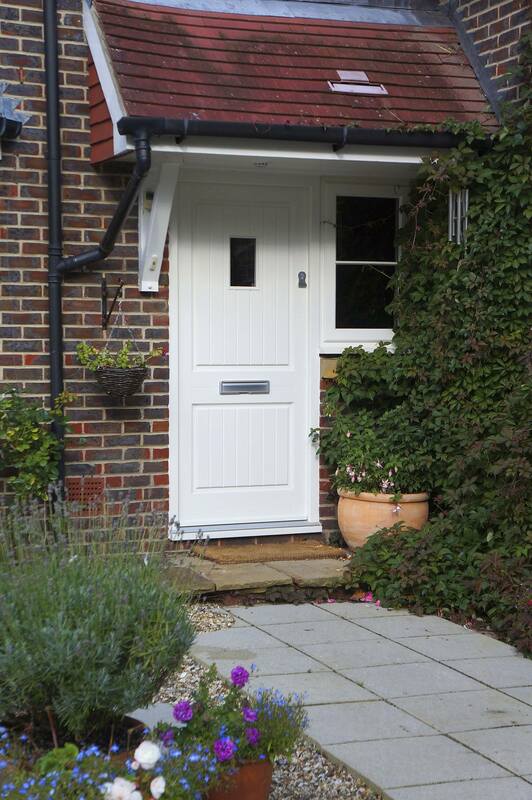 By looking at front door designs around the country we built a collection suitable for every kind of home. 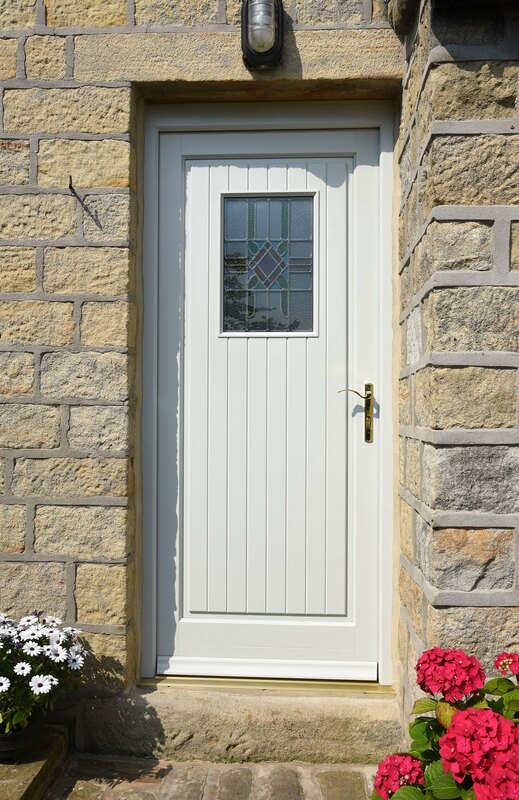 In our collection you will see Entrance Doors with glazed panels, those suitable for conservation areas, smart panelled doors, practical stable doors and sharper, more contemporary styles. Whichever style you choose, every door is hung on robust, fully adjustable hinges, colour co-ordinated to the door threshold. Security is assured with robust multi-point locking mechanisms, featuring hook bolts and deadlock which meet Secure By Design standards. 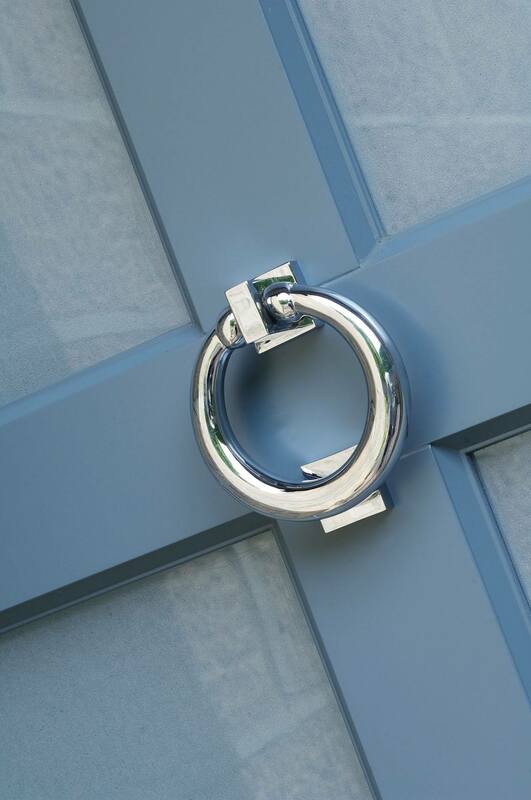 Polished Chrome Ring door knocker from Samuel Heath, on an Urbane Grey front door featuring sandblasted glass. 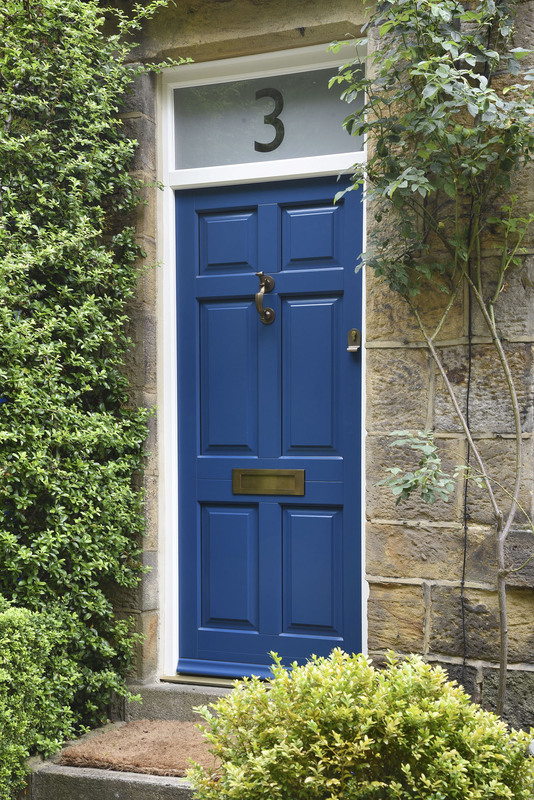 Bevel glass design on an Oxford Clay painted front door. 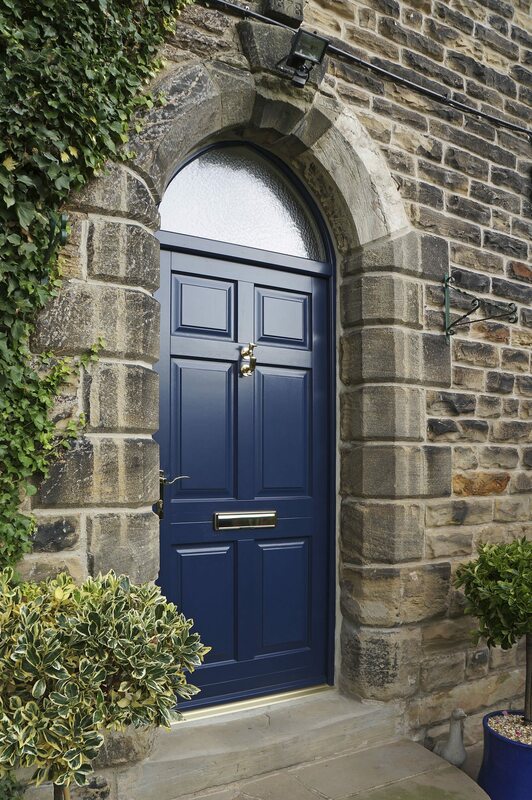 Chadlington front door design in Oxford Blue featuring a semi-circular toplight with obscured Kathedral glass. Polished Brass doctor’s door knocker, letter plate and Chatsworth door handle. 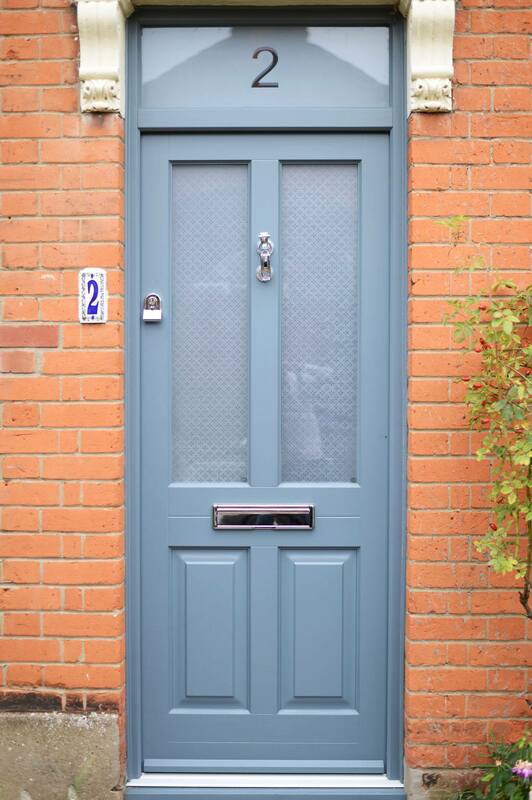 Bevington door style in London Grey, featuring double height toplight and sidelights. Antique Black handle and letter plate. 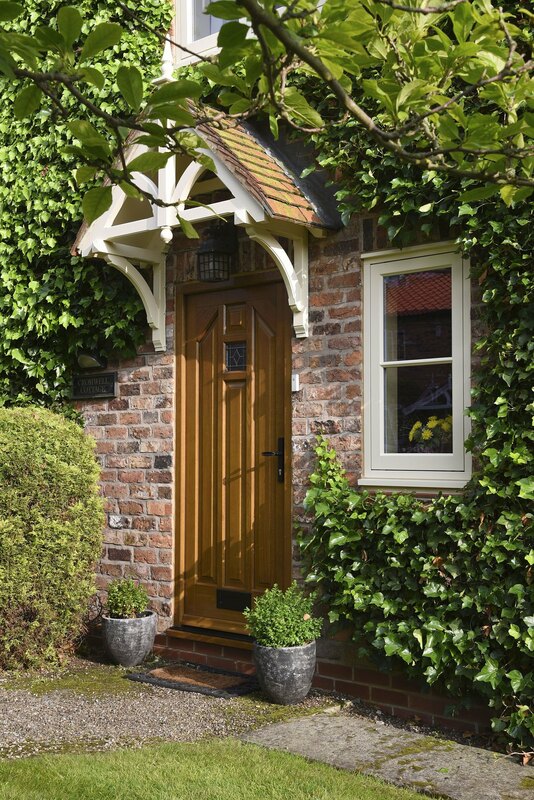 Your local Timber Windows showroom will also advise you on the layout of your Entrance Door, including the positioning of ironmongery – we have an extensive range which includes elegant period handles, traditional letter plates and knockers, including our beautiful Samuel Heath collection. A selection of decorative glass options, based on authentic Victorian stained glass motifs, has been uniquely commissioned for the range. These may be selected from a variety of colour palettes to complement the door colour or finish. 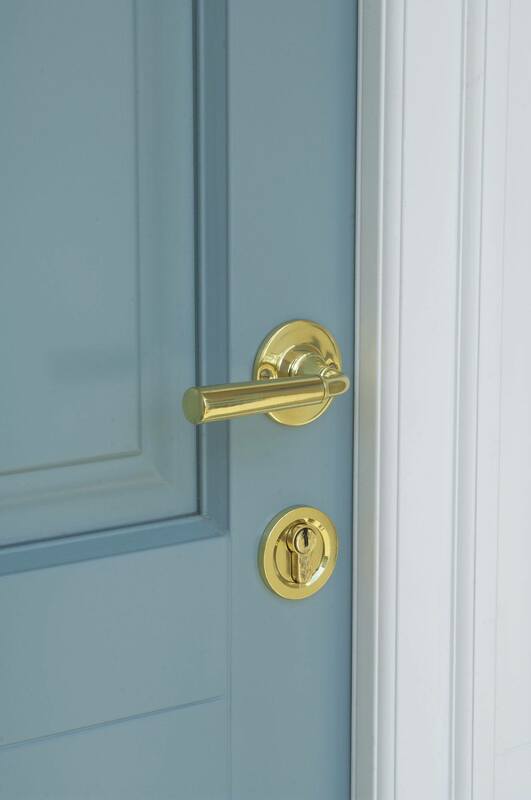 Polished Brass Profile shoulder door handle and escutcheon from Samuel Heath on an entrance door with a colour complementary to Farrow & Ball ‘Dix Blue’. 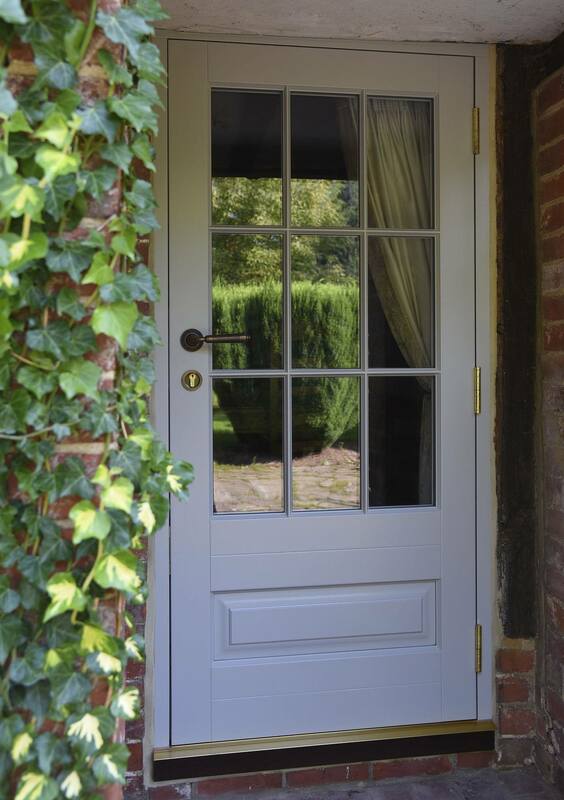 Belbroughton door in Tent Grey with an Off-White Frame and 18mm astragal glazing bars. The door features Etched Star glass design and a Brass Chatsworth door handle. 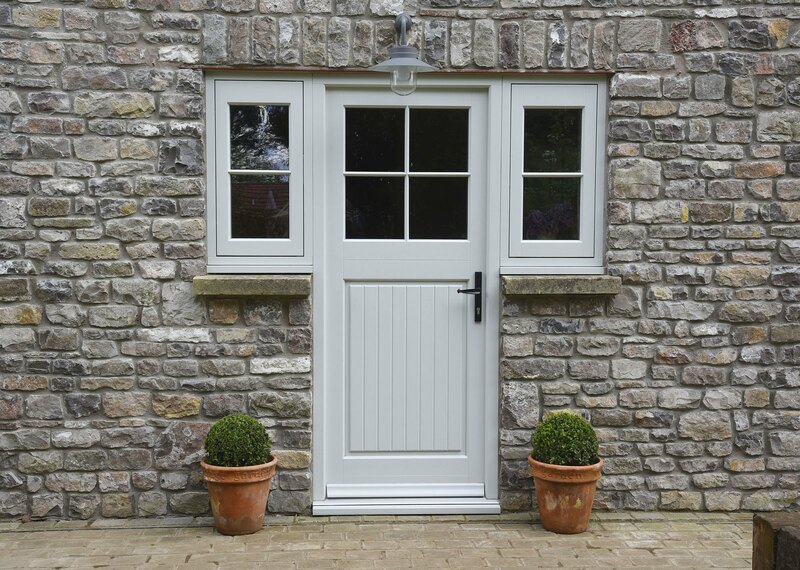 Thorncliffe stable door in Tent Grey with an Off-White frame featuring Kathedral patterned glass. Antique Black door handle and letter plate with Black doctor’s door knocker. 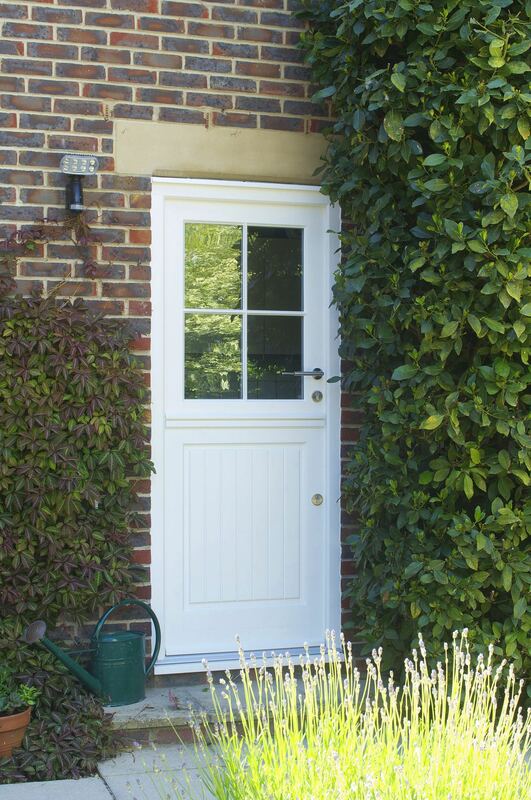 Bardwell entrance door design in Off-White, featuring 18mm astragal glazing bars. Antique Brass Unlacquered Profile Shoulder door handle by Samuel Heath (closest matching handle option to the item shown). Samuel Heath Antique Brass Unlacquered Contour door handle and escutcheon on an Agate Grey door. 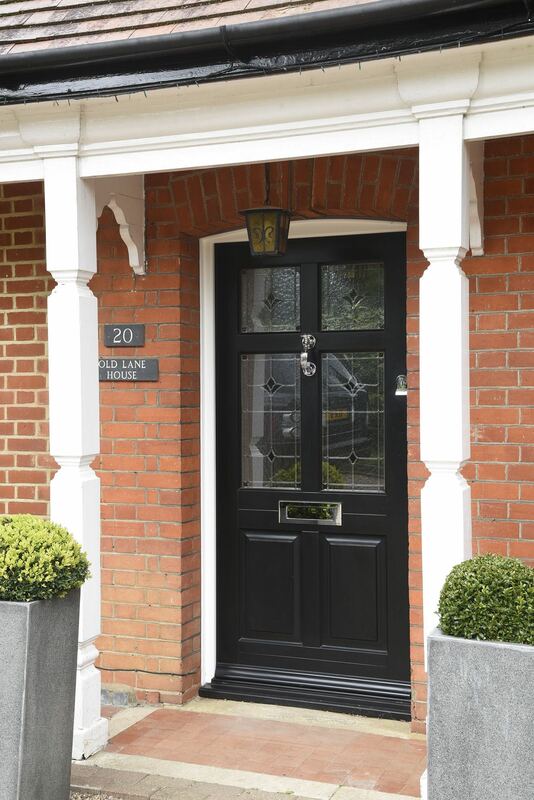 Frenchay front door in Black with a White frame, featuring Classic stained glass design with Kathedral patterned glass. Polished Chrome escutcheon (townhouse locking system), medium sized letter plate and doctor’s door knocker from Samuel Heath. 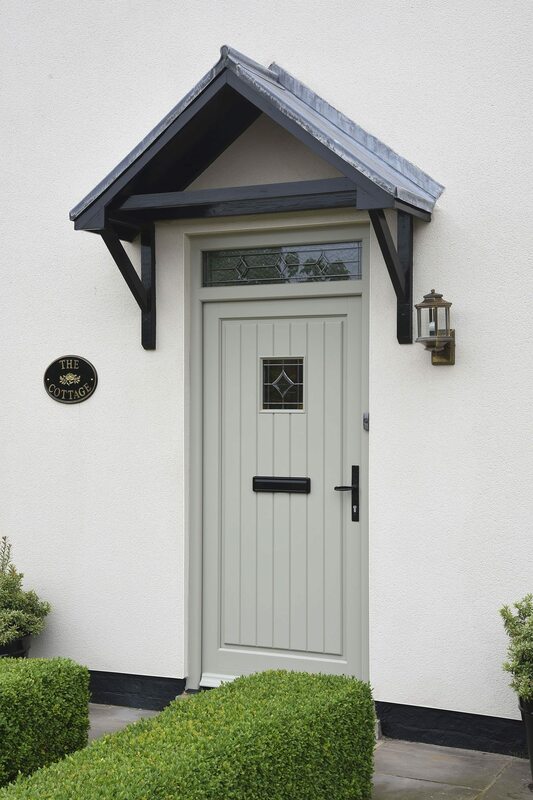 Stratfield entrance door with flag windows in Calm Grey, featuring 18mm astragal glazing bars and a Black Cottage door handle. 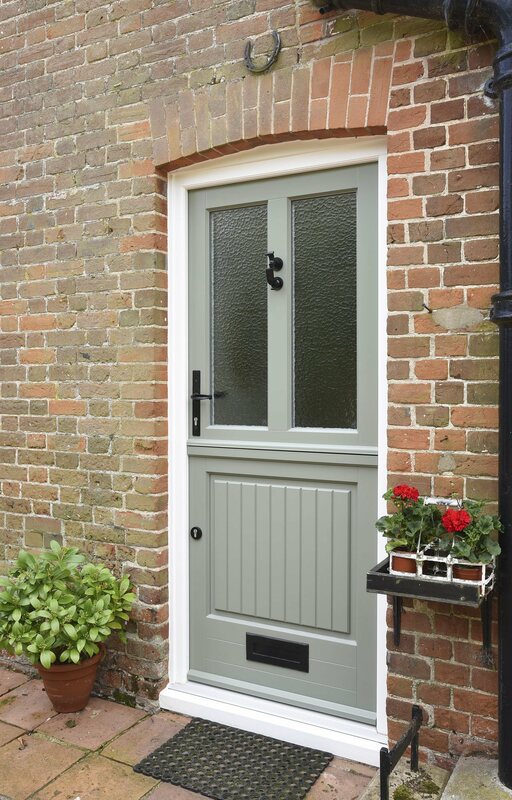 Stratfield entrance door in a colour complementary to Farrow & Ball ‘Burnt Verdrgris’ with Straw frame. 18mm astragal glazing bars and Etched Sun glass. Black letter plate and escutcheon (townhouse locking system). 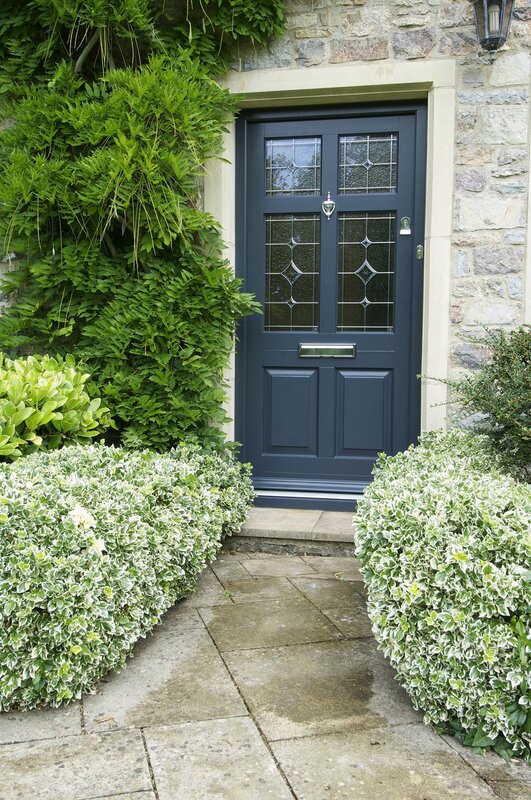 Frenchay front door in Anthracite featuring Bevel leaded glass design on Kathedral patterned glass. Chrome letter plate, Urn door knocker and escutcheon (townhouse locking system). Queen Anne lead decorative glazing featuring obscure and clear panels on an Oxford Clay, Norham entrance door. 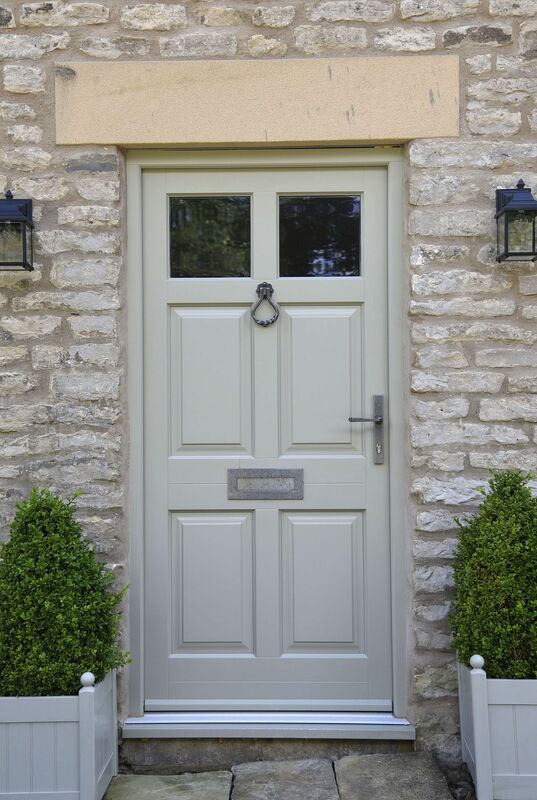 Norham entrance door design in Oxford Clay with a French Grey frame. Queen Anne lead decorative glazing featuring obscure and clear panels. Polished Chrome letter plate and escutcheon (townhouse locking system). 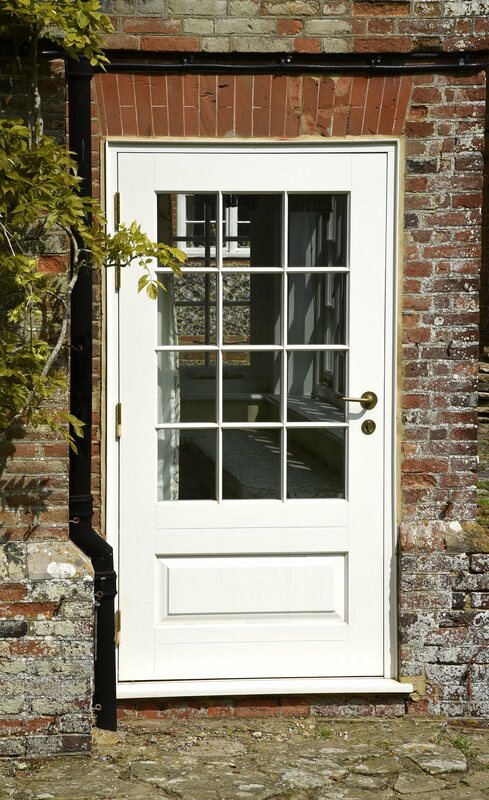 Stratfield stable door in Off-White, featuring 18mm astragal glazing bars. Julian contemporary door handle in 316 Coastal grade stainless steel. 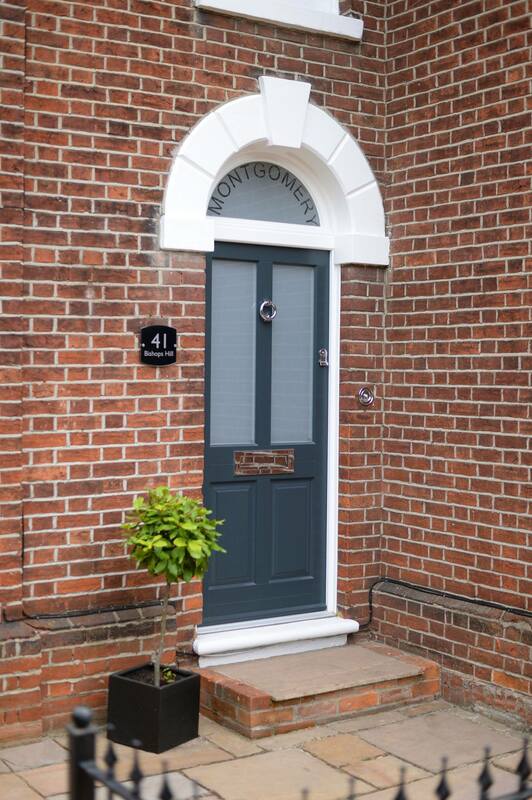 Our Entrance Doors are also available as a Town House door with no external handle, as escutcheon plate at eye level which replicates the look of a traditional mortice lock and a centre pull knob. Our architect designed Contemporary Entrance Doors are available in eleven styles to complement modern properties, or add individually to a period home. 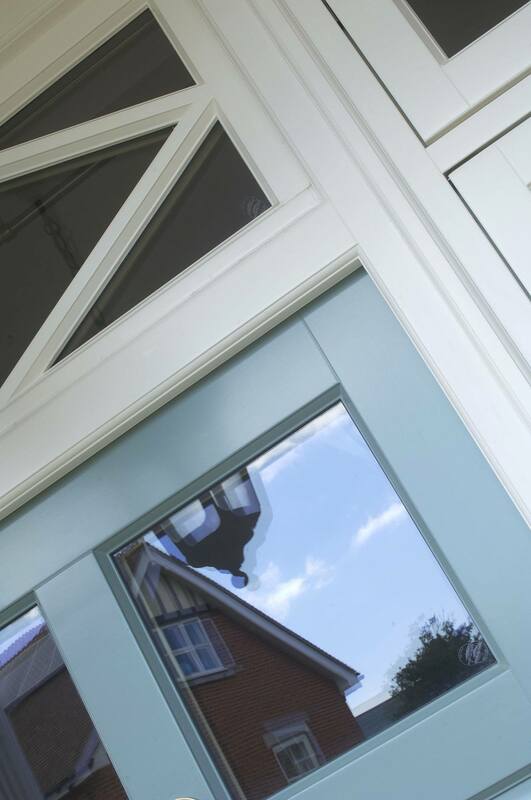 The doors feature clean, understated lines, finished with crisp modern ironmongery. 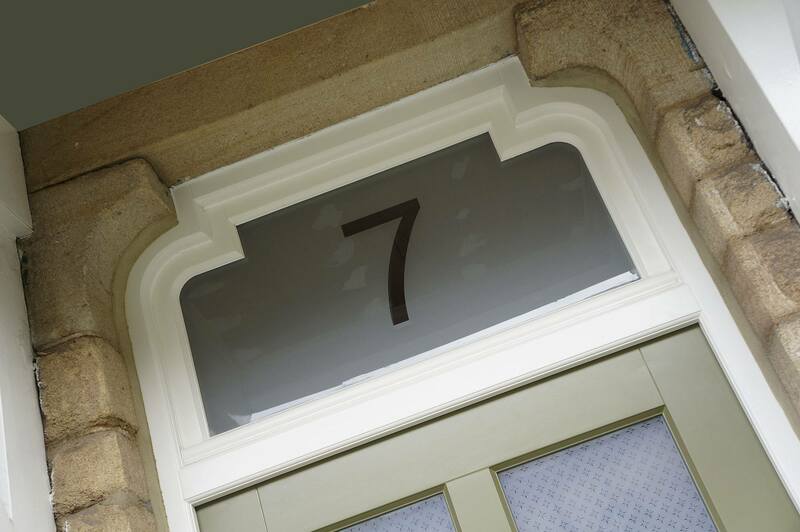 An etched glass effect may be chosen to provide privacy, including an option to have your house number reversed out. 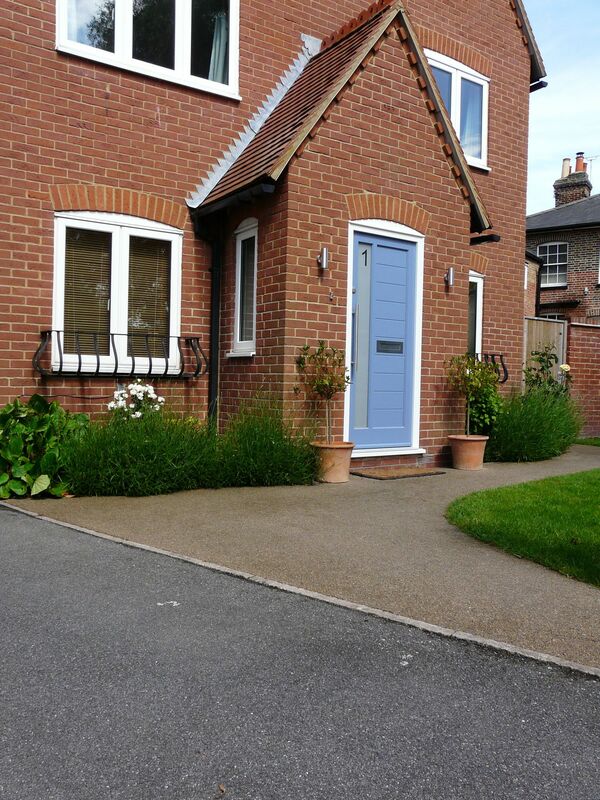 Chalfont front door in a colour complementary to Farrow & Ball ‘Dix Blue‘ with an Off-White frame. 36mm astragal bar diamond design to toplight. Ironmongery consists of Polished Brass Profile Shoulder door handle, medium sized letter plate and doctor’s door knocker, all from Samuel Heath. 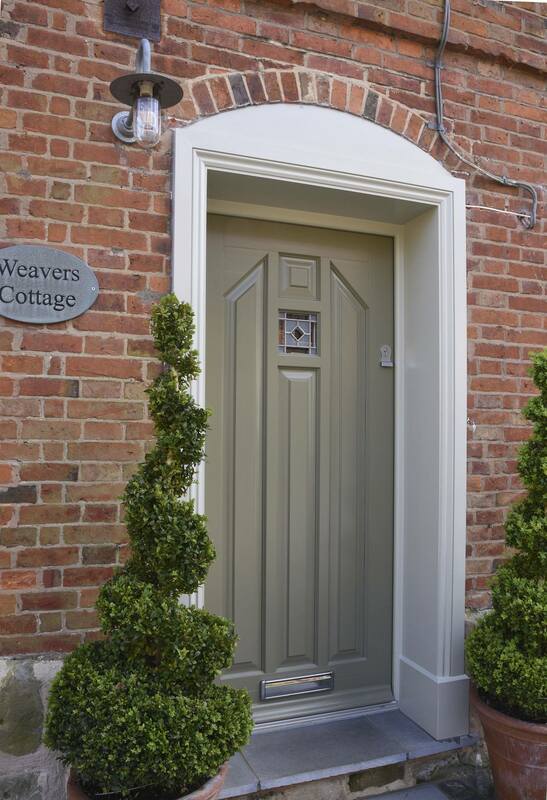 Staverton door design which has been adapted to a bespoke design, with flag window in Off-White. Satin Chrome letter plate and escutcheon (townhouse locking system). 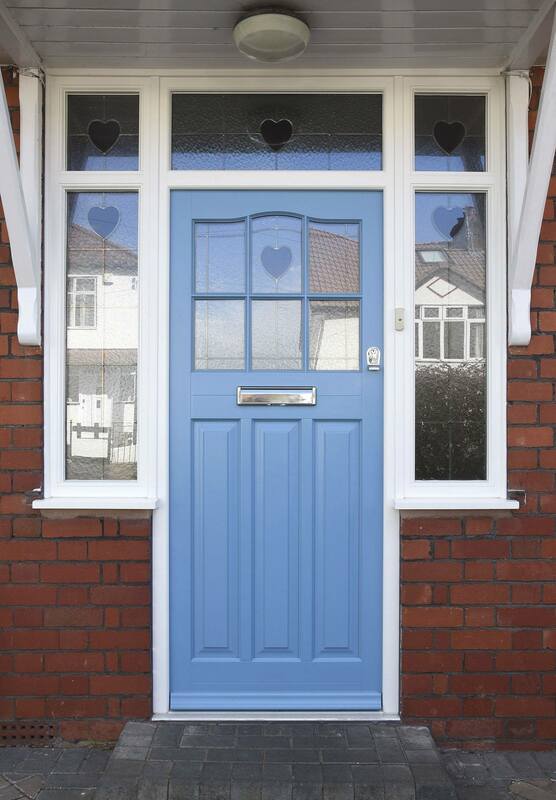 Frenchay front door in Verdi with an Off-White frame, featuring Etched Star glass to the door panels. Custom toplight design with sandblasted glass and etched house number. Ironmongery includes Polished Brass letter plate, Chatsworth door handle and doctor’s door knocker. 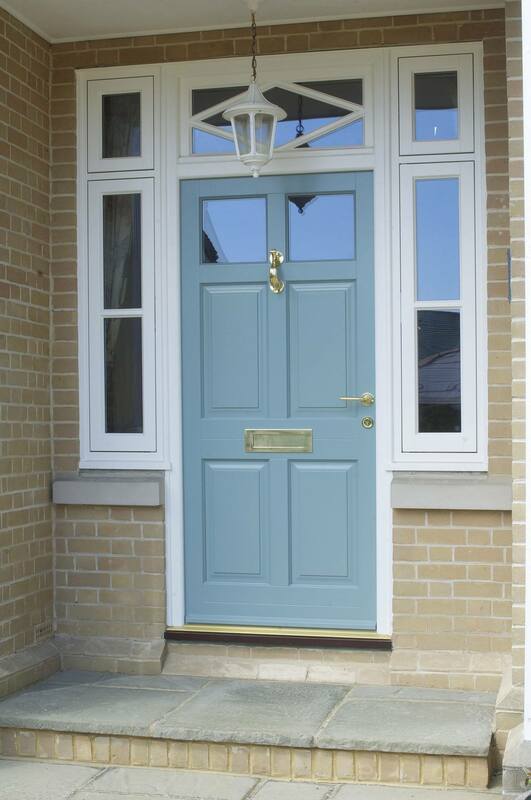 Abbotsbury Conservation front door design in Pastel Blue with Off-White frame. Bespoke stained glass motif with Kathedral patterned glass, including the toplight and sidelights. Polished Chrome letter plate and escutcheon (townhouse locking system). Belbroughton entrance door and toplight in Cream, featuring 18mm astragal glazing bars and Brass Chatworth door handle. Dowr contemporary door design in Blue Grey with a White frame featuring sandblasted effect Santinovo glass with etched house number. Guardsman pull handle in 316 Coastal Grade stainless steel and a contemporary letter plate, also in stainless steel. Staverton entrance door in French Grey, featuring Bevel Amber leaded glass design and Kathedral glass toplight with Queen Anne lead. Antique Black door handle with black letter plate. 36mm astragal bar diamond design to toplight with Chalfont front door. Colour complementary to Farrow & Ball ‘Dix Blue‘ with an Off-White frame. 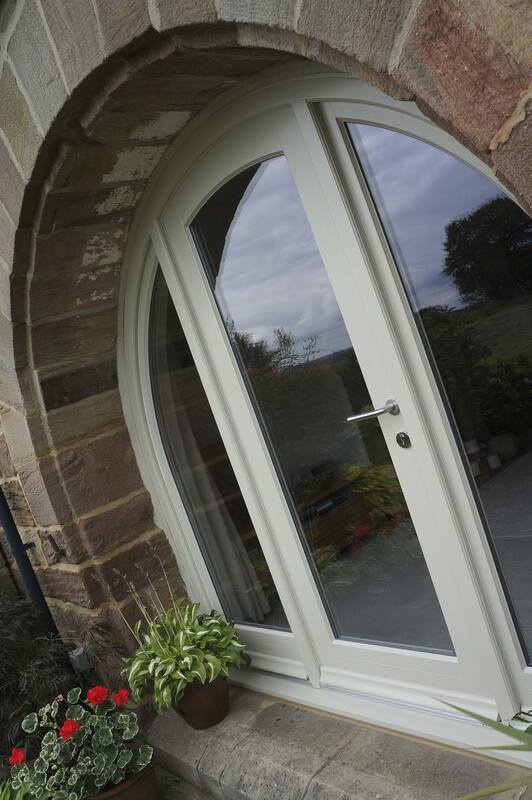 Apsley entrance door with sidelights in arched shape design. colour complementary to Farrow & Ball ‘Bone‘ with contemporary stainless steel door handle. 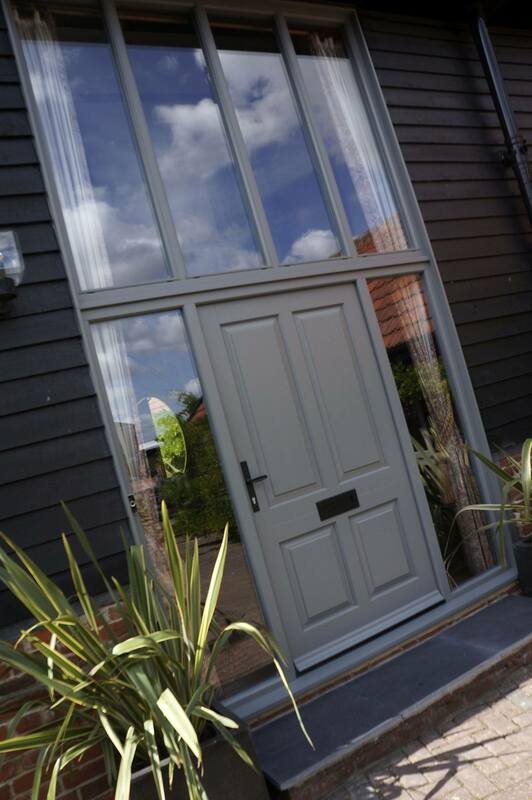 Chalfont front door design in French Grey. Pewter Avon door handle with matching Blacksmith traditional letterbox and knocker. Bardwell entrance door in Agate Grey featuring 18mm astragal glazing bars. Samuel Heath Antique Brass Unlacquered Contour door handle. 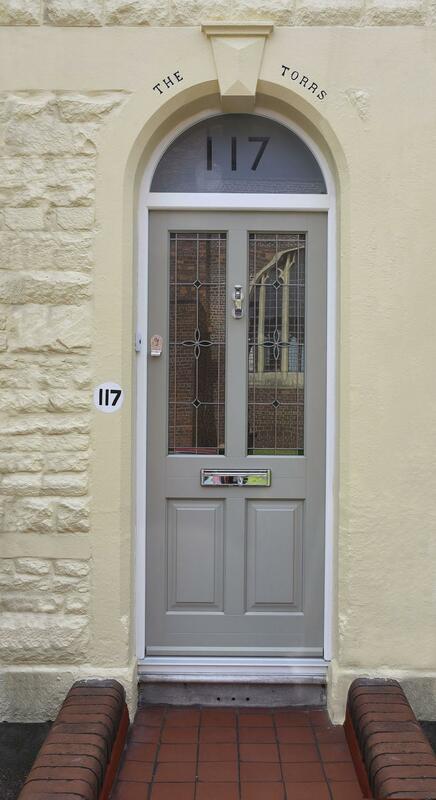 Kingston entrance door in Tent Grey with Antique black letter plate, door handle and Arena patterned glass. 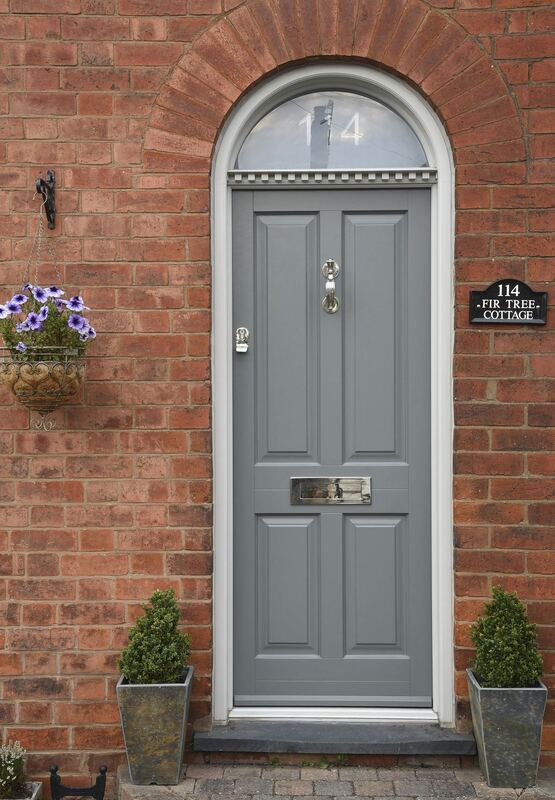 Kingston front door in Urbane Grey (closest match) with Etched star glass panels. Sandblasted effect Satinovo glass with etched number in toplight. Polished Chrome doctor’s door knocker, letter plate and escutcheon (townhouse locking system). 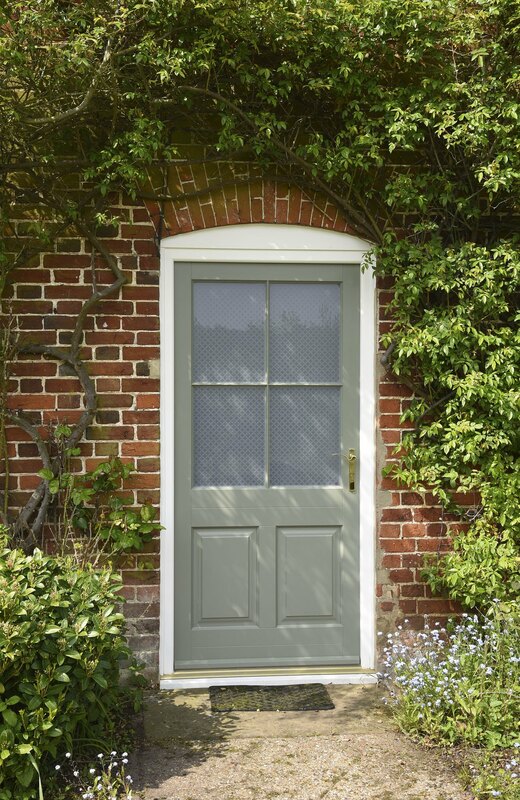 Bevington door design in London Grey with Porcelain frame colour, featuring period Dentil Mould detail below the toplight. Sandblasted glass toplight with etched house number. Polished Nickel medium sized letter plate, escutcheon (townhouse locking system) and doctor’s door knocker, all from Samuel Heath. 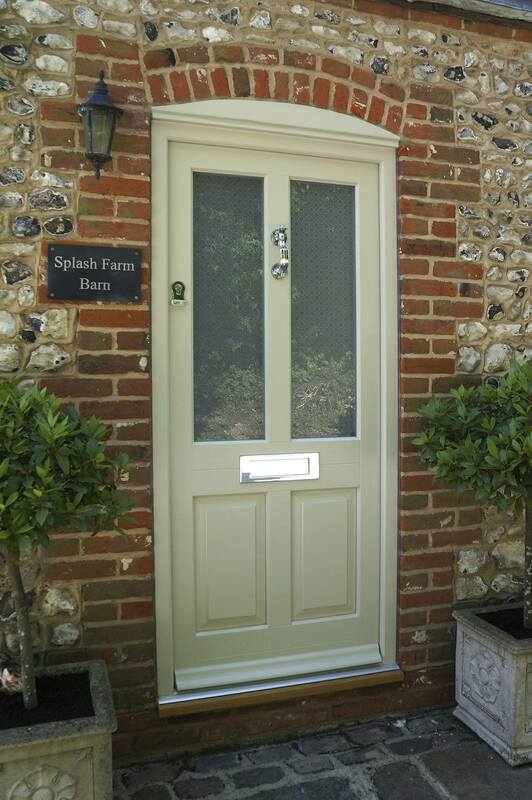 Chadlington front door design, with custom glazing detail, in Fortnum with a White frame. 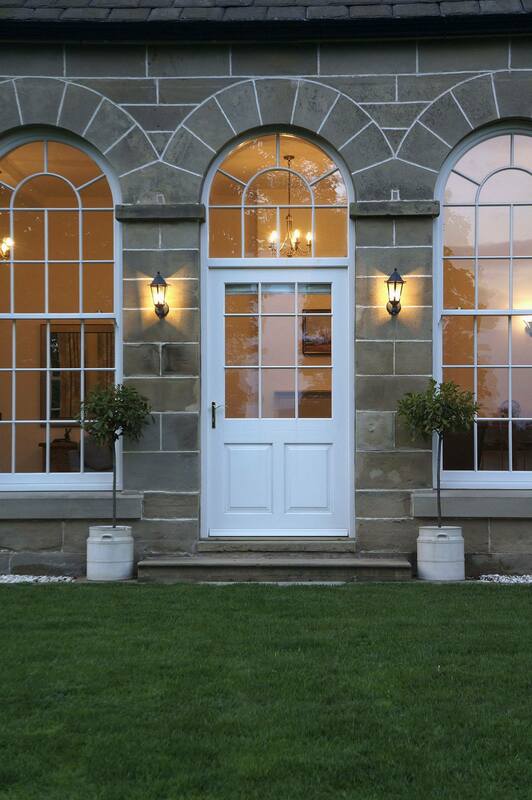 18mm astragal glazing bars with a bespoke arched design. Black doctor’s door knocker and letter plate, with handle sourced by the customer. Staverton entrance door design in Calm Grey featuring encapsulated original stained glass and a Brass Chatworth door handle. 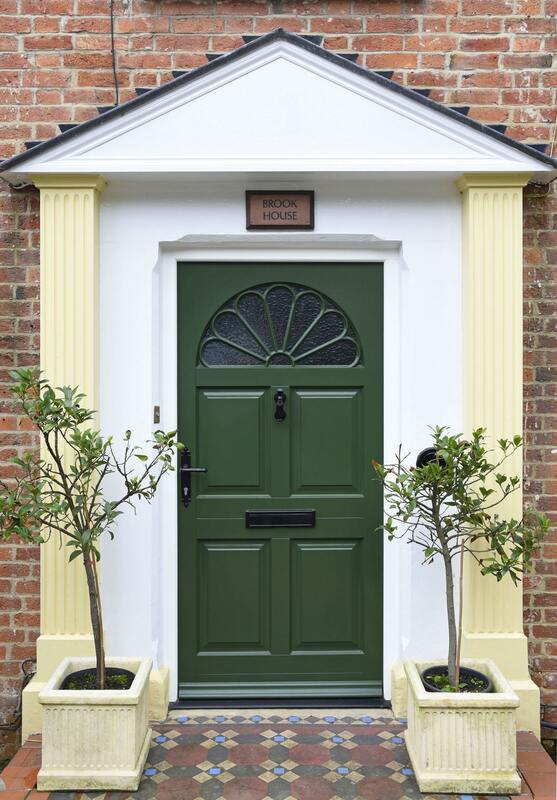 Every style of Entrance Door is available hand-finished in hundreds of traditional shades and timber stains, including RAL colours and shades complementary to those from the Farrow & Ball and Fired Earth paint ranges. 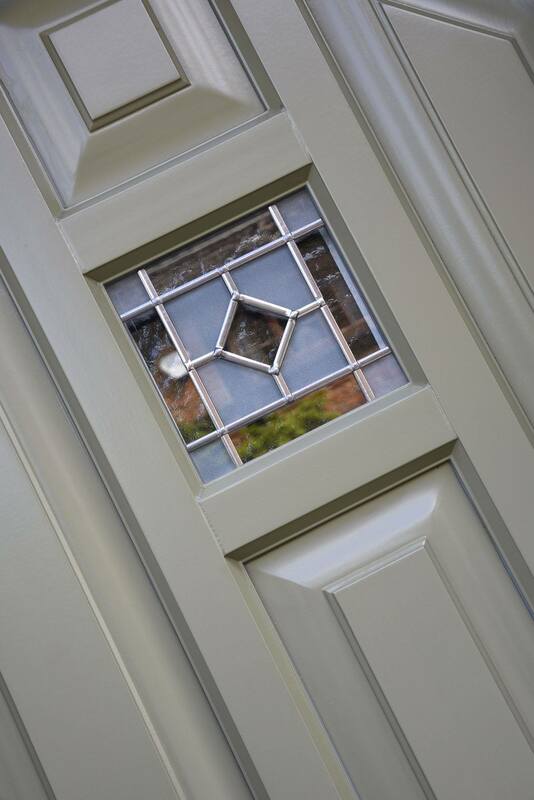 We also offer the option to vary the colour on the inside of the door, so that it can match your internal decor. 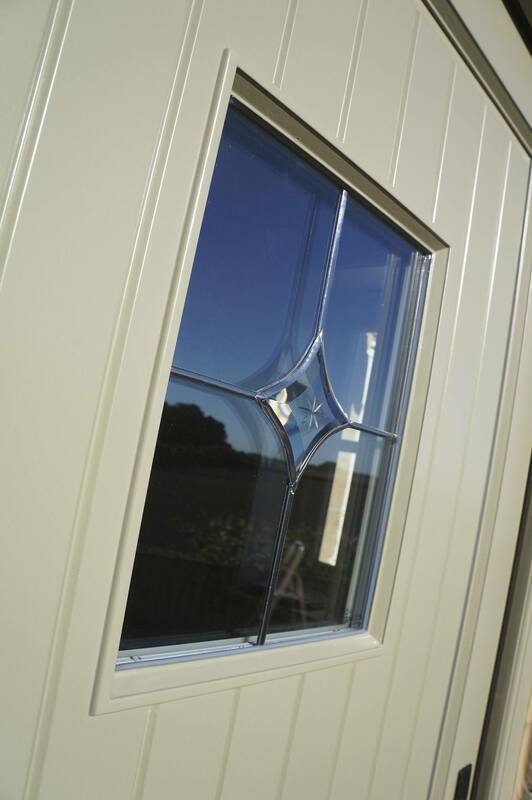 All of our doors use multi-layered, warp and twist resistant timber throughout their construction, with high specification glazing fitted as standard. Factory applied paint finishes ensure a long life with very low maintenance. Norham front door design with a Dark Oak stain, featuring Queen Anne lead decorative glazing and Kathedral glass. Black cottage door handle and Antique Black letter plate. Custom toplight design with sandblasted glass and etched house number, above a Verdi coloured entrance door with an Off-White frame and Etched Star glass to the door panels. 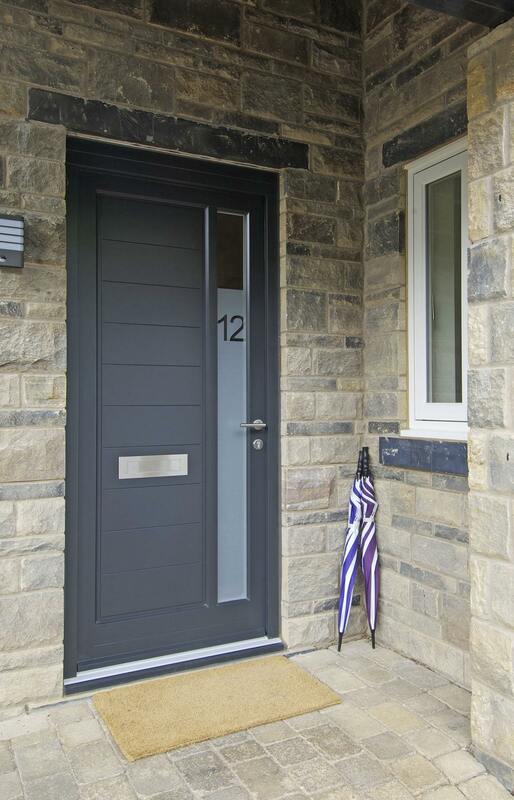 Dowr Contemporary door in Warwick Stone with a sandblasted effect vision panel and etched house number. Ironmongery consists of Julian 316 Coastal grade stainless steel door handle and stainless steel letter plate. 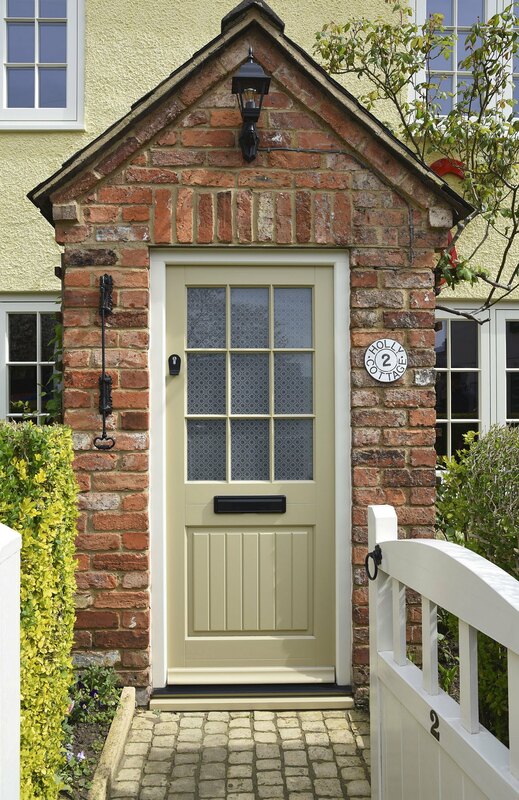 Kingston front door in French Grey with a White frame. Daisy leaded glass design in Green with Kathedral patterned glass and sandblasted toplight with etched house number. Polished Chrome doctor’s door knocker, letter plate and escutcheon (townhouse locking system). 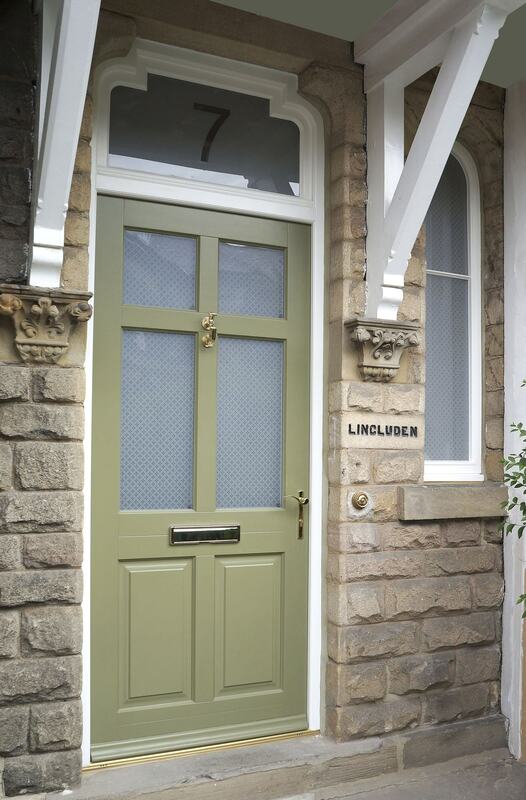 Kingston entrance door in a colour complementary to Farrow & Ball ‘Old White‘ featuring Etched Sun glass panels. Polished Chrome escutcheon (townhouse locking system), doctor’s door knocker and medium sized letter plate from Samuel Heath. Chadlington front door in Talisman with a White frame and a sandblasted glass toplight with etched house number. Antique Brass Unlacquered medium sized letter plate, escutcheon (townhouse locking system) and doctor’s door knocker, all from Samuel Heath.